Being absent from school too often, excused or not, can put a child’s academic achievement—and future health—at risk. A new policy statement from the American Academy of Pediatrics (AAP) in the February 2019 Pediatrics, “The Link Between School Attendance and Good Health,” recommends health care providers promote good school attendance as preventive medicine. 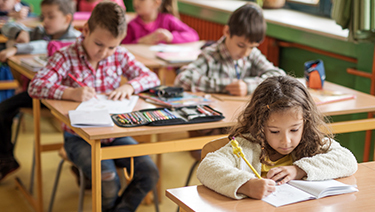 "School absences can add up quickly,” said Mandy Allison, MD, MSPH, FAAP, lead author of the policy statement and a member of the AAP’s Council on School Health, which developed the report. “Asking about school attendance and approaching chronic absenteeism as a health risk factor can have a big impact on patients’ lives,” she said. More than 6.5 million U.S. children, about 13 percent of all students, miss 15 or more days of school each year, a benchmark for chronic absenteeism that’s been used by the U.S. Department of Education. At least 10 percent of kindergarten and first-grade students miss a month or more of the school year, while about 19 percent of all high school students are chronically absent. Common, preventable causes of school absences range from infections such as influenza to poorly controlled chronic conditions like asthma. Socioeconomic factors tied to absenteeism include unstable housing conditions, transportation difficulties, a history of maltreatment, exposure to domestic violence, and being called on to care for younger family members. The report highlights proven measures to improve school attendance, including increased hand washing, school-located influenza vaccination programs, access to school nurses and counselors, and on-site medical, oral health and nutrition services. The AAP encourages pediatricians and their colleagues caring for children to promote school attendance. "Promoting good school attendance is simply good medicine,” said Elliott Attisha, DO, FAAP, a co-author of the policy statement and a member of the AAP Council on School Health."